PhilaPlace - Jacob C. White Jr. 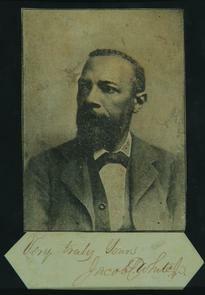 Portrait of Jacob C. White Jr. With signature. Text from historical marker at 1032 Lombard Street: "White was the principal of the Robert Vaux School for forty years. He was a founder of the city's first Black baseball club, the Pythians, and the first president of the Frederick Douglass Memorial Hospital."